Australia’s largest legal recruitment firm approached Splash to help them create a print campaign to shine the light on career opportunities. 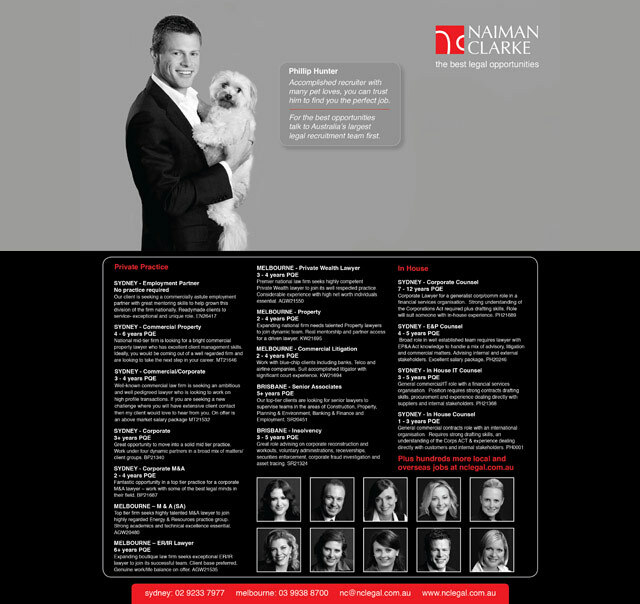 The new branding campaign saw all 12 legal recruiters be photographed in a style that was refreshing for the recruitment category. Each execution highlighted a passionate private side that dramatized their commitment to finding the most suitable legal job for every candidate. The ads ran in Lawyers Weekly, Australian Legal Journal as well as The Australian. Brand awareness markedly increased and the campaign was a great success. With some staff turnover, the campaign concluded after 12 months and a new creative direction began.